Corsetry in it’s broadest sense, is all about fashion outlines and firm foundations - from the earliest waist enhancing leather belts worn by the Minoans as far back as 2500BC, to the latest in figure shaping technology using 'powernet' fabrics and lycra to shape, support and enhance the figure. Throughout the ages, both men and women have sought to improve and enhance their figures. The archetypal corset shape - the shape everybody thinks of when the word ‘corset’ is mentioned, is the Victorian corset which slims the waist while enhancing the roundness of the bosom and the hips to give the classic feminine hourglass shape to any figure regardless of size. Corset Making by Julia Bremble of Sew Curvy Corsetry, is an e-book which provides an illustrated guide to making a Victorian style corset for the purpose of fashion or costume. With over 200 colour photographs, video and diagrams, it is the best resource currently available to those who want to learn corsetry the easy way. The methods and materials given in the book are not exclusive to the Victorian period and can apply to other styles of corset, although there are probably as many methods as there are corsets! This book is just the beginning. Readers do not have to be expert at sewing - if you can sew a straight line, you can build a corset - ‘build‘ because sewing is just part of the process - there are other bits of hardware which have to be manipulated using tools which may be more at home in the garden shed, than the sewing room, but when all of these parts are assembled in the right order, the result will be a stunning piece of wearable architecture that with care, will last and be admired for many years - perhaps even generations! With a good working knowledge of basic sewing techniques and terms, corsetry will develop sewing abilities very quickly not only as far as stitching is concerned, but also through the need to be patient, dextrous, organised and practical - essential skills for any creative pursuit! Corset Making aims to pass on the most practical methods of corset building knowledge built up through years of making and research, in order that the reader, can easily discover basic methods and techniques which have been, up until now, dotted about in many different, and sometimes hard to find, places. It is hoped that beginners will have a good grounding, and that intermediates will have a source of reference and inspiration from where more innovative designs and techniques can be developed. In practical terms, there is nothing like a waist cincher, or ‘waspie’ (a shorter version of the underbust), for achieving a flawless uber feminine hourglass shape underneath a dress. A properly fitted corset will be totally smooth between corset and flesh and it is for this reason that 'traditional' corsetry is preferred by fashion designers, celebrities and brides. 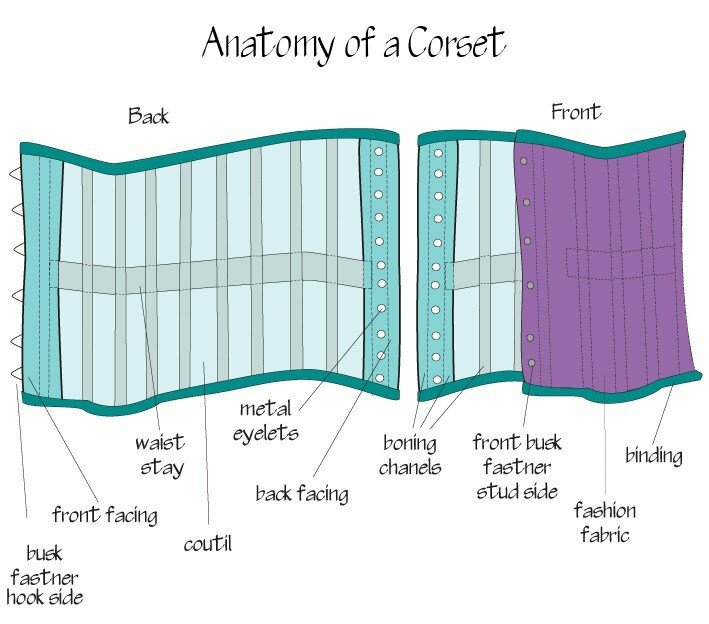 In order to be successful at making a corset, it is helpful to know how it works both in relation to the body, and also as a pattern which fits the body this is all explained within the e-book. Corset Making takes you through the whole process from the beginning with a short history of corsetry in fashion, right through detailed discussions of all the components and techniques, and ending up with two practical projects which detail the exact process of making a corset using all the information given in the e-book, step by step, so that ultimately the reader will be able to create a beautiful, professional standard corset. Here is a reveiw by Lucy Williams of Lucy's Corsetry.